You go to start your Ford Ranger and, guess what? It doesn’t crank. More often, than not, this is the sign of a bad battery. 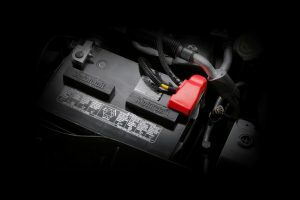 When should you replace a Ford Ranger battery? Batteries don’t last forever. Over time, the plates inside wear out and will no longer hold enough of a charge to start the engine. So, how often should you replace the battery in your truck to avoid getting stranded? Generally, a lead-acid battery (the type found in a Ford Ranger) lasts between three and five years. Life expectancy is shortened if the vehicle is regularly exposed to extreme temperatures, or if it sits for a long time without being driven. In other words, it’s not possible to know precisely when a battery will fail. To avoid getting stuck, look for signs the battery is wearing out. Also, get the starting system tested regularity (annually is a good rule of thumb). If you’re lucky, you may get an indication the battery is bad before it fails completely. For example, the vehicle may crank slowly, have dim headlights, or require occasional jump starting. In other cases, there will be no symptoms at all, until one day, the truck won’t start or take a jump. Because it isn’t always possible to tell when a battery is failing, the starting system should be checked on a regular basis. A professional, such as one from the Fairley and Stevens Ford Service Center, can do this for you. These days, a vehicle’s entire starting system, including the battery, can be tested in a matter of minutes with a handheld device. You can have the procedure performed while your truck is in for an oil change or other regular service. It’s quick, easy and the results are incredibly accurate, so you know for sure if your battery needs to be replaced. There isn’t a way to increase battery life, per se. A battery can only withstand so many charge/discharge cycles before it’s weakened and fails. But you can take precautionary measures to avoid cutting its life short. To start, make sure it’s charged regularly. The alternator replenishes the battery while you’re driving, but if you plan on letting your truck sit for a while, you’ll want to hook up an alternate power source. A device called an automatic charger, or “battery minder”, can be used to maintain a battery in a vehicle that isn’t being driven. Another tip is to make sure the battery cables are tight, clean and free of corrosion. Poor connections can allow stored battery voltage to find an alternate path to ground, reducing service life. Also, make sure a hold-down device secures the battery, so it doesn’t get damaged from bouncing around. If you’ve got any questions about the health of your truck’s battery, stop by Fairley & Stevens Ford and have your 2019 Ford Ranger checked out. The experts in our service center offer professional car battery replacement and testing. All good things come to an end – whether it be a favorite television show, a much-loved rock band, or the Ford Ranger. Eight years ago, production of the pickup came to an abrupt halt when it was discontinued. But fortunately, the story has a happy ending. Next year, North America’s favorite midsize truck will return as the all-new 2019 Ford Ranger. Check available 2019 Ford models at Fairley & Stevens. Although Canada has been deprived of the Ranger since 2011, Ford has continued to build the truck abroad. The new North American model will be based on the global platform but will also receive exclusive upgrades. The 2019 Ford Ranger is available in both two-door and four-door body styles. Trim levels include XL, XLT, and Lariat. There’s also two appearance packages, Sport and Chrome, along with an FX4 Off-Road package. In many ways, the Ranger looks like a smaller version of the F-150. Like its big brother, the midsize truck boasts muscular body lines and a prominent grille. The family tradition carries on inside the cab, with high-quality materials and easy to use controls. Decor can range from utilitarian to luxurious, depending on the trim level. Even though the Ranger is considered a small truck, it packs big performance. Under the hood, you’ll find a Mustang-sourced turbocharged four-cylinder engine, which has some serious get up and go. From there, power flows through an advanced 10-speed automatic transmission. Rear-wheel drive comes standard, and optional four-wheel drive is available. In North America, the Ford Ranger also gets an exclusive steel frame for maximum strength and durability. The new foundation helps with pulling toys, as does the optional Smart Trailer Tow connector (used to alert drivers of faulty connections). A heavy-duty suspension increases capability even further. And for traveling off pavement, there’s Trail Control – which acts as a type of off-road cruise control – and Terrain Management with selectable driver modes. An available rear-locking differential provides extra grip at low speeds in mud, snow, sand or gravel. It also, helps on steep, slippery grades, such as boat ramps. The Ranger is a hardworking pickup that’s also equipped with the technology to have a rockin’ good time. Occupants enjoy full connectivity via the SYNC 3 infotainment system complete with Apple CarPlay and Android Auto, and Ford + Alexa personal assistant. FordPass Connect 4G LTE Wi-Fi is also offered, which can be accessed up to 50 feet outside the truck. A little over a decade ago, driver assistance technologies were only offered on luxury cars. 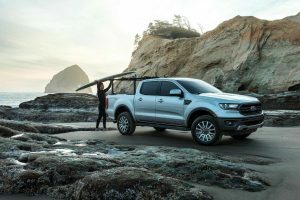 Now, the 2019 Ford Ranger is bringing these features to the midsize truck segment. Onboard, you’ll find standard Automatic Emergency Braking, and available Lane Keeping Assist, Lane Departure Warning, and Reverse Sensing. Plus, a class-exclusive Blind Spot Information System with trailer coverage is offered, along with Pedestrian Detection and Adaptive Cruise Control. Soon, the 2019 Ford Ranger will be unleashed at Fairley & Stevens Ford. Stop by to learn more about this reborn legend, or to schedule a test drive. 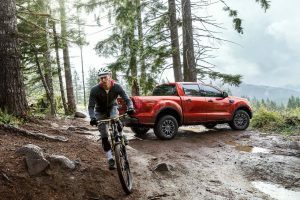 The 2019 Ford Ranger is a vehicle unlike any other in the current Ford lineup, offering a ton of power and performance for its size! This includes a ton of exceptional features, all of which are designed to deliver the best possible experience when you’re driving on the road! Continue reading to learn more about this great vehicle and what it has to offer!